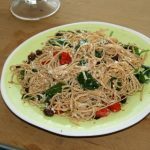 This recipe was insired by Rusty who asked me to make a cold pasta salad with calamata olives and goat cheese. Truth be told, it was mostly directed by him, I was just the one who made it and cleaned up the recipe a bit. In the end, it was very simple, yet tasty. A great dish for someone who wants a nice easy side dish. Cook whole wheat pasta to medium firmness. 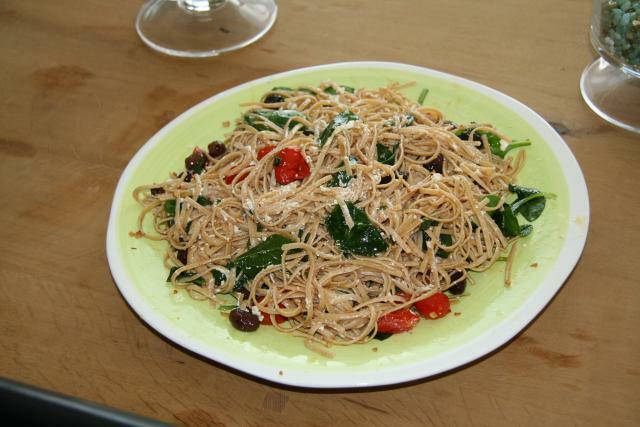 While Pasta is cooking, heat a very generous (1/2 – 1 cup) portion of olive oil over medium heat. Add garlic & RedPepper flakes. Saute for a minute or so. Add Oilives, & 1/8 tsp of onion powder. Simmer over medium heat, covered, for about 2 minutes. Add tomatoes, and fresh basil. Simmer medium-low for about 5 minutes, or until tomatoes and olives are soft. Strain pasta, and put back in empty pot. Mix all ingredients into pasta, along with crumbles of goat cheese. Toss well – add extra olive oil if needed. Let cool, and serve as a room temperature or cold salad.